We got up at 5 a.m. after next to no sleep. At least I had no sleep. I just never can manage to get a decent nights sleep before a big marathon. I had myself a breakfast cookie, but skipped the coffee this morning. Roy and I took the el from Cumberland right to Grant Park. I met Laura and Linda in front of the park and we made our way to the start line. I actually felt really good going into this race. I had tapered pretty well, and had definitely trained enough. In fact I'd run four marathons in the last four months, so I knew I could go the distance. While waiting for the stretched and chatted. Linda and I were in our Marathon Maniac shirts with our race nails of gold with yellow and black tiger stripes. We found another maniac and chatted. It was fun. Before long Lady Antebellum sang The National Anthem and the elites were off. Of course they were WAY ahead of us, so we didn't see them. Five minutes later the wheelchairs took off, and finally we started walking towards the start. My heart rate was abnormally high, for me, during this entire race. I'm not sure if it was the heat, or what. Normally I average about 140 over a long distance run with 5:1 intervals, but this time my average was 160! As you can see by the picture, I just continually slowed as I ran. My shoes started bothering me at mile five, but I tried to put it out of my mind. So my knees started in singing at mile 13 along WITH my shoes. My feet joined in soon thereafter. Energy-wise, I was great. Could have gone all day. (I practically DID go all day! LOL!) But my legs just would not move any faster! My back even chimed in for a few choruses, and I rarely have back pain in runs! Mile two brought an unexpected treat. Roy and Jim were there cheering us on already! Yay! I love seeing my honey on the route! Right at about mile three we crossed back over the river again. I love the Chicago River and the bridges. It's so beautiful to have this great waterway running right through the city. During mile five we ran through Lincoln Park. It was beautiful! What a neat place! The first thing we saw was this pond full of ducks and geese. As we got further in, we passed the Family Farm. The divergence of the farm setting shadowed by giant skyscrapers is an interesting sight. We could hear some of the animals and it reminded me of the Disneyworld marathon when we ran through Animal Kingdom and could hear monkeys. Marathons just don't have enough monkeys, I always say! Between six and eight we were able to run near Lakeshore Drive. I'd been hoping we'd run ON Lakeshore, but when I did so the next day I realized that there is no way there was enough room to fit a potential 45,000 runners. It was neat to see Lake Michigan on this race since on Grandma's marathon I ran along Lake Superior, so it was like seeing a family friend. I also got to see Roy again! Sadly it was from afar. He was behind a lot of people, so I couldn't get a race hug. I needed one, too. I was already starting to feel pain in my feet. My shoes felt like they were pinching and I was sure I was going to have tons of blisters. I've only gotten a blister once on a marathon, and it was insignificant. So this was a new experience. Mile 8 took us to Broadway and OMG they were AWESOME! This was the "gay" part of town and it was colorful and fun! Men in women's swimsuits served us water, there was a gay gun brigade who had the precision of the most stringent Rifle Corps. Another favorite area was Mexico. The people there were SO wonderful, handing out oranges, candy, water, and waving flags at us. There were long lines of kids with their hands out hoping for high fives from the runners. High fives are good luck, so every chance I could I'd make my way to the kids. I figure you never know...maybe one of them will get a high five from a runner and think "Some day I want to do that!" It was about this point that we lost Linda. With so many people it was easy to misplace someone! We'd always kind of split up at each water station, and then get back together at the end. This time we got back together, but she was a bit behind Laura and I. We ran for awhile and then turned back to look, thinking she was with us, but she wasn't. We felt REALLY bad! Somewhere in miles nine and ten we went through some neat neighborhoods with wonderful brownstones and even more wonderful people. It felt like the entire city of Chicago turned out. It was really getting warm so lots of people had hoses out for us, and their own water stops as well as music and the MUCH needed "lucky high fives". We ran into Old Town, which is REALLY cute in areas. Laura and I were still together but each time we'd split at a water stop, I had to work a little harder to catch up with her. I wasn't sure what was going on, but my legs and glutes were really tight and felt very "heavy". I just tried to put it out of my mind, since there's not a whole lot I can do on the race. But I could feel my pace slowing just a tiny bit. I hoped it would be temporary, and we both talked about probably being able to break 5 hours. My PR is better than Laura's and we normally run at the same pace, but she was on fire today, and I was apparently dipped in cement! Back over the river again at mile 12! It was REALLY getting warm at this point and we were in many places where we were running into the sun. I didn't think it was bothering me much until I started looking every now and again at my heart rate monitor. Wow! I was REALLY maintaining a high heart rate! I didn't feel out of breath or anything, but obviously I was working harder than I normally do on a long run! Mile 13 was when I lost Laura. We did cross the halfway point together, and I was really hoping for negative splits. Within about half a mile, though, it was obvious that something was going on. My legs just felt like every step was pulling the rubber bands on the backs of my legs tighter and tighter. We were headed back downtown and I was trying to keep up with Laura. Finally I realized that she needed to feel okay running her own race, and since mine had changed, I needed to be okay running mine. At this point I needed motivation and to regain my focus, so I popped in one ear bud. Yes, I know that MP3 players are forbidden, but I'm a revolutionary! ;) The music helped take my mind off the pain, as did the people on the sidelines. Miles 14-16 saw us around the downtown "loop" area. It was fun to run through just THRONGS of people screaming and yelling! There were water stops, at this point, about every mile so there was never a time when I felt like I needed more water. It was great. We also had a few sponge stops, and some open fire hydrants to run through. At one spot they had a sponge stop and right past it an open hydrant, so all the dropped sponges were full of water. We had to run over those and it was SUCH a funky feeling to run through and over squishy sponges fat with water, Gatorade, and sweat. At mile 16 we ran through the UIC and then into Little Italy. Oh man everything smelled SO good in Little Italy! I'd have liked to stop for a spaghetti lunch, but somehow I thought that might be counter productive to the whole "finishing" concept, so I decided to wait for later. Normally I don't do a lot of counting of miles during the marathon because I usually don't want it to end until about mile 24...then I start thinking about the finish line. On this one, though, I found myself over focused on the mileage, often hoping I was further than I really was. I'd try to push out even the THOUGHTS of how far I had to go, but couldn't seem to block that noise. Plus, no matter how much pain I'm in, I always remind myself that this is a CHOICE and I am blessed to be able to do this even when it hurts. Besides, this race was for Todd. He had no option to get out of bed on a Sunday morning and run a race because he was still in a coma. I will be damned if I was going to even let myself THINK a negative thought! Every time I'd start to head to that point in my mind, I'd think of Todd...my student who was in a serious accident on Sept 26. I was running this race in his honor, so maybe in a way it was good that it was difficult for me. My hard, on that Sunday morning, was nothing like his hard. I'd remind myself that every time my brain would consider complaining. Mile 23 took us shopping! Okay, I didn't stop, but I do love Michigan Ave. It looks a LOT different with thousands of people lining it, though! Everyone was yelling and screaming. More high fives. It was GREAT! What a homecoming. Finally I saw my second favorite number...25! I stopped and snapped a picture and couldn't WAIT to see Roy at the finish line. The last mile actually went pretty well. I was running awfully slow (I think it was a 13 min+ mile) but I was running! (Kinda) I searched the sides for Roy and didn't see him. I crossed the finish line, hands held high, saying my 100th prayer for Todd and thanking him for running with me. This was probably one of the more challenging marathons I've run. It wasn't the course, although I was wishing for some hills at a few points. I do think that I do better with some hills because it allows me to use a different set of muscles or my muscles in a different way for awhile. My suspicion is my shoes. I didn't like them from the first, but I didn't want to be a hassle and return them. I should have because I couldn't afford another pair. I hoped I'd just get used to them. (Of course if anyone had told me that they were suffering in their shoes, I'd say "Take them back!") I had run one other marathon in them and was pretty sore for DAYS afterwards, which isn't normal for me. I'm going back to my old Brooks. I've also decided that in destination marathons, I'm going to run alone. I really love getting to know new people on the route and talking while I run, but neither of my partners were in the mood to talk much. Or maybe they thought I wasn't. It isn't that I don't like running with them, I do! But I think we all felt guilty when we lost each other, but at the same time probably felt relieved when we realized that we were alone. Laura could surge on. Linda could relax into her head where she was dealing with a lot of emotion. I could retreat into my head and really focus on my reason for running. After I made it through the finish area and got my medal I gave Roy a call. I'm so glad I had my cell phone. It was SO good to hear his voice! As soon as I heard him I started to cry. I told him it was hard and I was in a lot of pain. Pretty soon I could feel my chest tightening. I didn't have my inhaler because I'd had to call in sick Friday and it was in m classroom. I realized I had to stop with the emotion or I'd need the medical tent. I was able to relax and talk to him again to find out where he was. He was over in the 27th Mile area at the letter Z (we'd agreed to meet there) with Jim, Laura and her parents and in-laws and her friend, Karen. Linda wasn't in yet. It was a LONG walk to the 27th mile. So long, in fact, that I think it truly WAS the 27th mile! I stretched and drank some water and inhaled a banana and granola bar on my way. My legs that were, apparently, made of lead. Absolutely a wonderful race all the way around. I know they had problems last year, and to be honest I got REALLY tired of hearing podcasters and reading blogs blasting the Chicago Marathon organizers. Mistakes were made that shouldn't have been made, but it got old. This year they appeared to fix it all. Not only was there more than enough water at every stop, but they even had emergency trucks pulling up with MORE water (in bottles) between stops when the Danger Level went from yellow to red. Every water stop (there were 21) had water and gatorade, some first aid options (some more than other), and a flag that indicated the danger level. We started at yellow, "Moderate" and it went up to red, but after mile 20 I noticed it had gone back down as a breeze was coming through and it did cool down a bit. 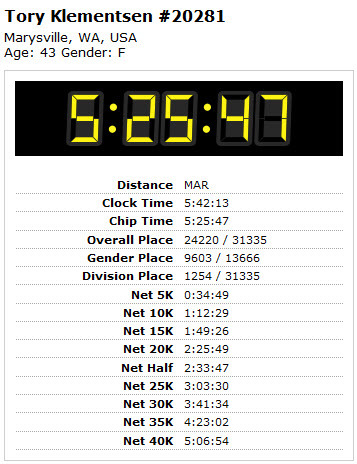 I don't know if I want to repeat this marathon because it was SO far away, but if I were able to I definitely would. I love Chicago, in fact I love it so much that on Monday we walked ten miles (I mapped it) soaking in the city. I thought this was one of the most well organized races I've been on. The expo was good, the race was great, and the support was out of this world. And most importantly, my prayers for Todd must have worked. He's been steadily doing better every single day! That alone was worth the pain. But as the man says, "Pain is temporary, victory is forever."